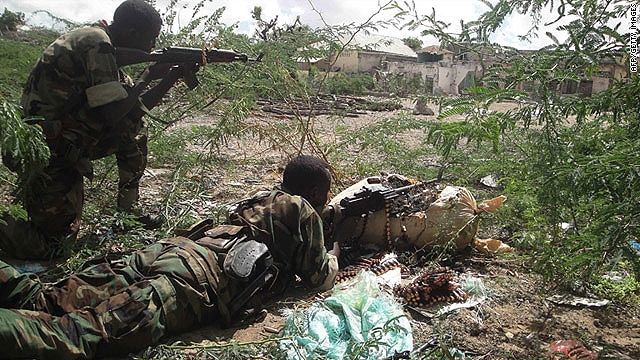 African Union soldiers fight with al-Shabaab, an Islamist insurgent group, in Mogadishu on May 22, 2011. Nairobi, Kenya (CNN) -- Somali government forces launched an offensive on Islamist strongholds in Mogadishu Thursday morning, killing 15 members of the al Qaeda-inspired group Al-Shabaab, a military commander said. Speaking to state radio, Col. Abdullahi Ali Anod, commander of the presidential palace, said the president ordered the offensive in northern Mogadishu. Fighting has intensified this summer as Somali government forces -- backed by troops from the African Union -- have battled insurgents from the militant Al-Shabaab. The fighting comes also as Somalia is battling its worst drought in 60 years and tens of thousands of famine-stricken people are walking for days into both Kenya and Ethiopia in search of food and water. David Orr, a spokesman for the United Nations' World Food Programme, said the fighting has not interrupted his organization's efforts to get aid into the area. Also Wednesday, a police officer was killed and four others were injured when a bomb exploded on Kenya's border area with Somalia, Kenyan authorities said. Authorities blamed the attack on Al-Shabaab. "Al-Shabaab militia have been a problem for us at our border because it's porous but our surveillance is high," said Michael Mbaluku, the area deputy police chief. CNN's David McKenzie and journalists Mohamed Amiin Adow and Lillian Leposo contributed to this report.